Two food experiences stand out from my trip. The first is simple and well on the tradition side of the current culinary spectrum. 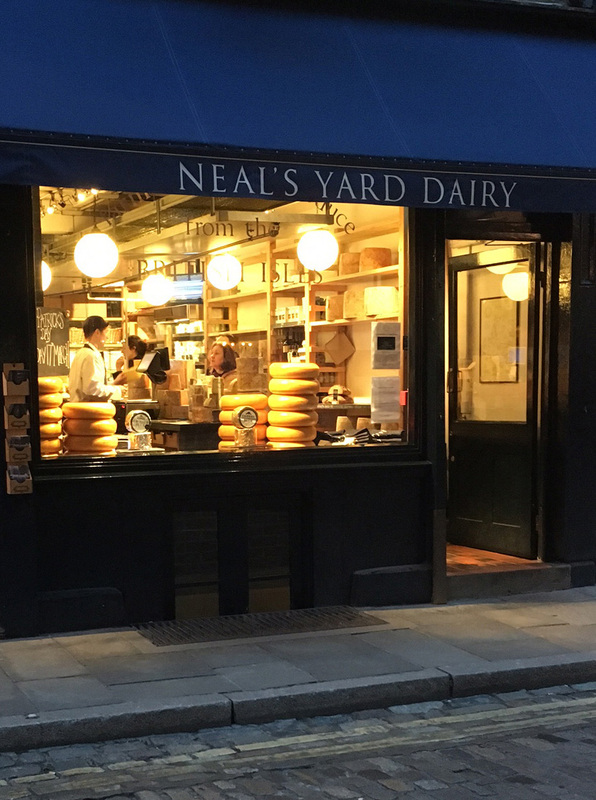 A British colleague of mine suggested I stop in Neal’s Yard Dairy in Covent Garden, which turned out to be a pleasant 12ish minute walk from our hostel. When first I walked in, I reeled, as my nose took in the smell of the cheese, all the cheese, and nothing but the cheese. Never before had the divine essence of the cow, which cheese surely is, permeated me so thoroughly. It was a small shop, maybe 25 feet deep, wide enough for two walls of shelves and a counter between them to separate mongers and their dairy-crazed clientele. The walls gave new meaning to the term well-rounded, for cylinders of cheese lined them all, with but one small half-shelf devoted to rustic sourdough breads. Perhaps a little space was also devoted to crackers, I don’t recall, but it was the cheese that dominated and the cheese that anyone stepping through the door saw, smelled, smelled again, and – thanks to generous and friendly folks behind the counter – tasted. After regaining my balance, I sampled several soft offerings from the udders of different ruminants along with a cheddar or two, finally selecting a small washed-rind cow’s milk number, milder (I was told) than its later-season versions will be, to eat with a quarter of a round of bread. This made for a lovely lunch in a park, as well as a couple of tasty breakfasts over the days that followed. But it was that first wave of olfactory bliss that sticks with me. The second great experience was a meal at the Clove Club. As I said in my post about Chicago’s Next, rarely do I dine fine, so to do so more than once in the space of weeks made me feel that I’d somehow been gifted a ticket to a world usually reserved for the rich and famous. The Clove Club is located in Shoreditch, a neighborhood that appeared to have a little more edge and grit than those near where we were staying, but also to be on the gentrifying upswing (as a recent Food and Wine article about it attests). 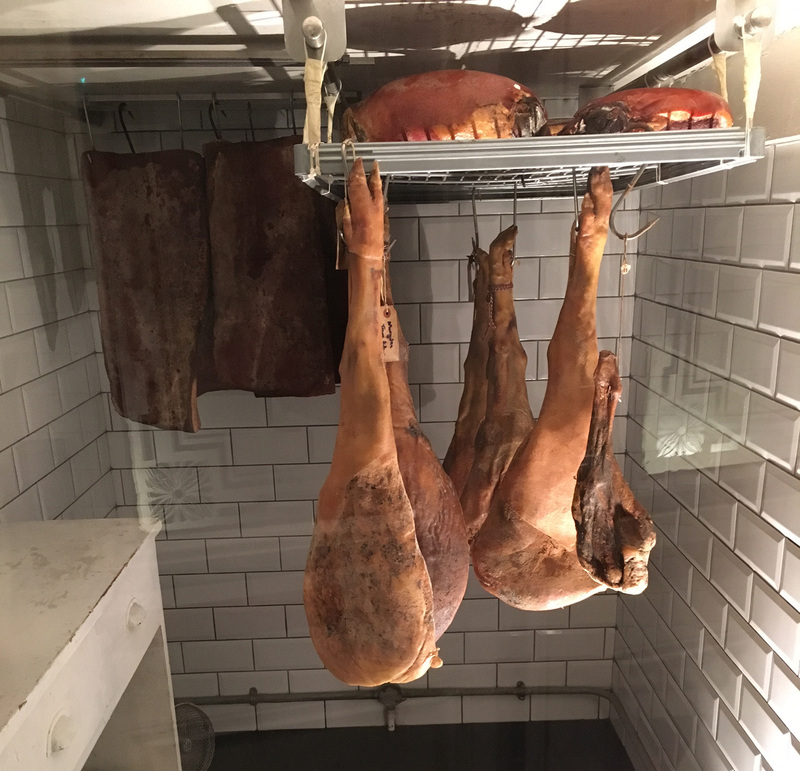 Entering, one sees a few seats around a u-shaped bar, on the far side of which are hanging three dry-cured hams – a promising, though ultimately misleading sign, as no charcuterie was served to us. For the dining room, around the corner from the bar, only a tasting menu was on offer, so the only choice was whether to get wine pairings. We did, choosing the more affordable “classic” (younger) rather than “prestige” (vintage) selections – more about that in another post. With a simple but well-executed gin gimlet, served while sweet-then-savory-then-deliberately rich but bland “snacks” came out, I relaxed into what promised to be a stellar meal. The first snacks showed a purity and complexity of flavor that is the mark of cooks who know what they’re doing. 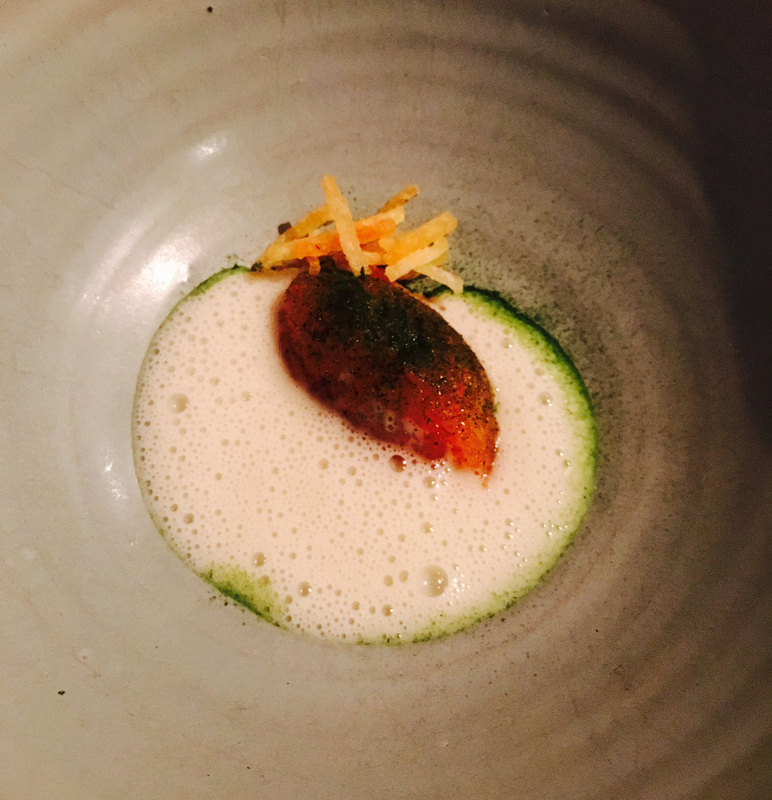 The salty and somewhat bland ones showed us – though it took a little time to realize it – that real thought went into how to effect transitions between courses so that one’s palate was ready to appreciate the complexity and purity when it came. Already memory (lousy memory) is letting me down when it comes to details, and reciting or describing the dishes wouldn’t begin to do them justice, but suffice it to say that trout tartare with potato (pictured), raw scallop with Perigord truffle, duck consumme with aged Madiera, and a rose, rhubarb, and sheep’s milk yogurt wonder of a dessert are among the things that expanded my sense of what food could be, despite the simplicity such naming of them seems to imply. The meal was paced well, left you wanting just a little more, and was perfect in nearly every way. Notable apart from the food was the service, which, as at Next, was friendly and inviting, rather than formal and reserved. Waiters were happy to answer questions, and the sommelier, who clearly knew what she was doing, was eager to present the wines she’d chosen to go with the food. A bank-breaker of a meal, but any time I’m in London, a broken bank it will be, for dinner at the Clove Club will be a must — or at least a visit to the bar, for that’s where the ham gets served, along with other cured meats, which, had we looked left on the way in, we would have seen hanging in the curing room near the door. Great A, little a, this is . . . POTATO DAY!